Now that Oracle Database 12c is available I upgraded my VM to try it out. The installation went very smooth and I was up-and-running in no time! My virtual machine had Oracle 11gR2 installed with the latest patch of APEX 4.2. With Oracle 12c APEX will be installed automatically, but the upgrade was smart enough to detect I had a more recent version of APEX and it looks like it didn't touch it. My existing workspaces and applications were functioning just fine after the upgrade. You find more information in the Oracle Database 12c documentation and the Upgrade Guide. I wrote another blog post about the new features that will be enabled in APEX when running on Oracle DB 12c. Another recommend read is the full New Features document of the Oracle database. Today the OTN Forums where updated. The site is still in read-only mode as they are fixing some issues. I need to get used to this new look and feel, but it looks more up-to-date design wise. You can expand a thread straight from this page by clicking on the arrow-down icon which is nice. 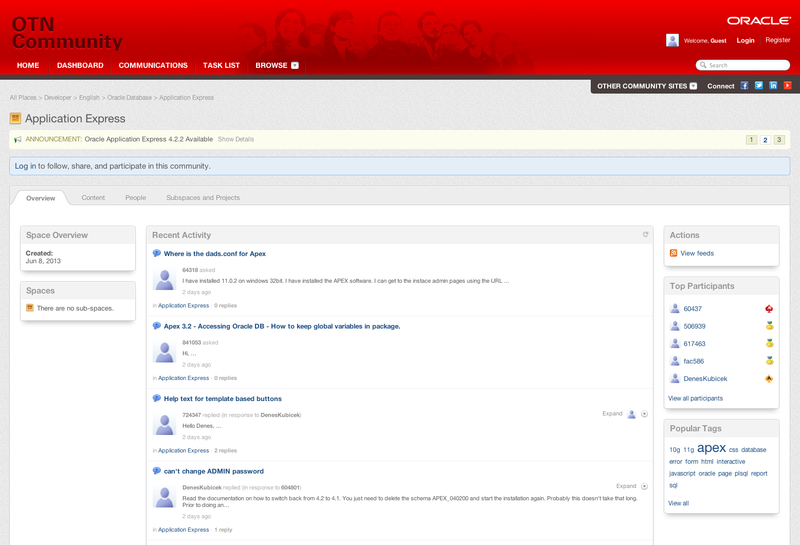 At first sight it might actually organise the threads nicer; for example when people start to use the likes, the content page shows a nice overview and it should give an idea what is playing in the community. The below content is based on a David Peake's presentation at APEX World 2013. The below are plans for APEX 5.0, not marked in stone objectives... 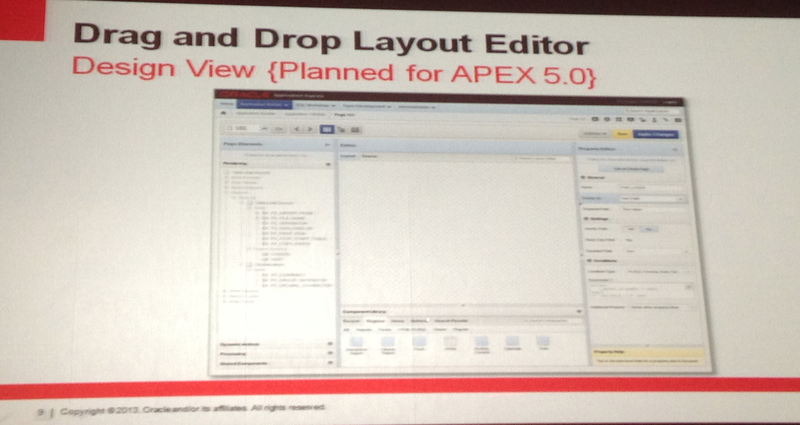 So there are no promises it will all make it in APEX 5.0 and things might be different in the final release. David didn't show any pre-release, but if this release follows previous version, most likely at ODTUG KScope '13 (end of June) the APEX team will show something live. The focus in APEX 5.0 is on improved developer productivity, which is great to hear for us developers. At the moment you can use some plugins to create modal dialogs, but in APEX 5.0 you'll be able to declaratively declare modal pages (so real pages no regions) with a nice UI where you can add buttons on the modal and have modals on top of modals. Yes! With HTMLDB 1.5, the first public release of APEX, we had the Component View where you saw the definition of your page. Since APEX 4.0 we got next to the Component View the Tree View, which allowed you to see the definition of the page the way it gets rendered. Using that view also increased productivity as you could drill-down faster to certain areas or right click on components to create other things and, based on where you were, it would skip steps in the wizard. So you can do drag-and-drop to create your page elements and edit them straight in the property editor. You keep doing that till you are happy and after hitting Apply Changes button it gets saved. So when you edit your page, remember the changes won't be applied automatically only when you hit the button (which I find good). I do wonder how the Layout Editor will work with for example responsive design; will it do ratios (percentage) or will it depends on the theme that it will be "pixel perfect"? When the early adopter comes out, it will probably be one of the first thing I want to see how the html gets generated behind the scenes. I also wonder if this editor will work on a tablet (iPad). Would be cool to be in a meeting, grap your iPad and discuss requirements, you quickly drag items on the screen hit Apply Changes and presto they see immediate results. It will also be interesting to see how they implement the Layout Editor behind the scenes as there is so much information on the screen. When do they get more data through an Ajax process or do they load most of it on the initial load? APEX 4.2 already introduced many HTML5 features and I'm a big fan of having more of those declarative available; things like new input types, improved HTML5 charts, incorporate more CSS3 instead of images, use CSS3 animations for transitions, latest jQuery Mobile features (panels, responsive table, dual range slider) etc. Another thing I would find interesting is, if they looked into local storage and offline capabilities declaratively. I never heard that would be on the list for APEX 5.0, it's just something I threw in, in this section for the future to think of. Designing your pages for PDF Printing has been something that isn't as declarative and easy to do as creating for example pages. The APEX Listener has now build-in FOP support, so they can use that and in APEX 5.0 they will add additional declarative formatting options and will make it easier to work with different templates, add control break and master/detail reports. They look into improving the Restfull web services publising capabilities, so it's easier and more performant to integrate with other databases and be in a more SOA architecture. This is something that is true for every version. Many small changes are done that makes APEX just a little bit better, more user-friendly and more productive. 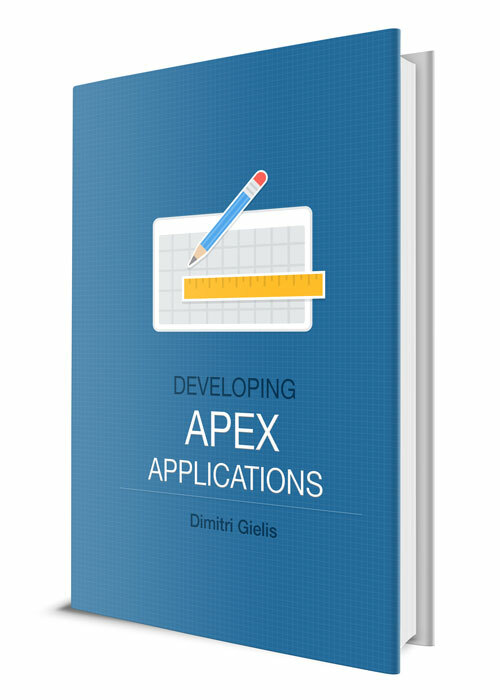 The new packaged applications were already included in the latest APEX 4.2 patch set. Another area they look into is allowing third-party apps to be included as packaged applications. This is especially useful in the Oracle Cloud. The current tabular forms are a bit old school - they got introduced in HTMLDB 1.5 and got native validations in APEX 4.0, but apart from that it's still a bit behind what you can do with normal page items. For example multiple checkboxes are not declarative in APEX 4.2 tabular forms. APEX 5.0 will introduce the Multi-Row Edit Region Type. It will be a new Region Type, so it would be a manual change of your existing tabular forms to move to that. The biggest advantage for the APEX team is that they don't need to maintain the old code. I'm more than happy to switch my tabular forms manually to get a more feature rich experience. This new region type would also allow to create a master-detail-detail page. Currently they are investigating different plugins; JQGrid is one of them which might be used behind the scenes. This has been on the list for some time, but it looks like APEX 5.0 will allow any number of IR to be defined on a single page. The security in APEX is a big area and has been increased in every release. In APEX 5.0 they will allow different authentication schemes to be used to control developer access and there will be more pre-built schemes to pick from. Although David didn't mention it, I hope SSO with AD is one of them and a remember me functionality will be declarative available. APEX 5.0 will continue to modernize and enhance websheet capabilities, improve usability, evolve the user interface and simplify the creation and maintenance of data grids. 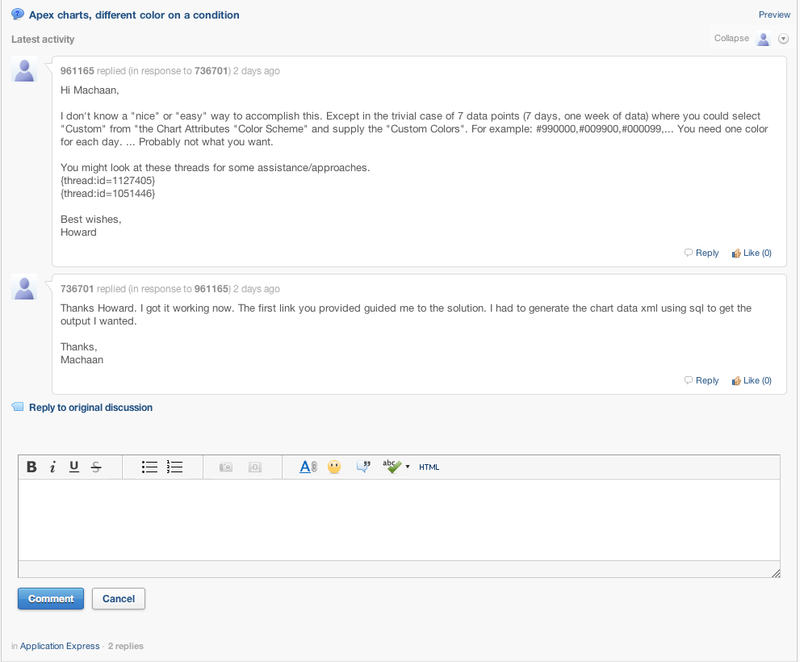 Websheets are as good as every other Wiki, but with Data Grids, which are so much more powerful. Again the above are things the APEX development team looks into, so it's not guaranteed it will make it in APEX 5.0. So when I said "APEX 5.0 will, read it as APEX 5.0 might".